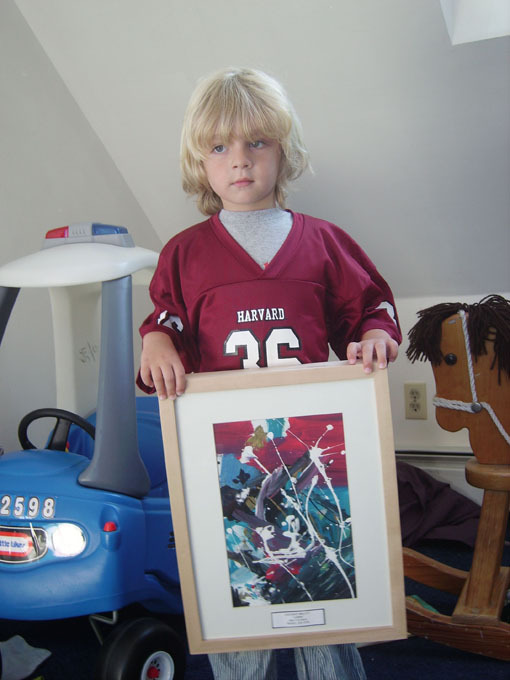 His work featured in galleries in NY, Boston, & London, Zachary Malott has been compared by most art critics as a four-year-old, Jackson Pollock. In July, 2008, Zachary and his father moved to a neat top floor beach apartment in Revere, Massachusetts. The apartment features an abundance of skylights and panoramic views of the ocean, Boston skyline, end of the blue subway line, and airplanes on approach to Boston's Logan Airport. Inspired by the new surroundings, Zach's dad started to do some painting, screen print art, and block prints. His painting technique was to take anywhere from two to eight canvas panels, line them up in a row, and splatter paint across them. This would make a future impression on young Zachary who would observe his father painting, usually in the direct path of flying paint. The splatter technique would soon become a trademark of Zachary's paintings as well. Eventually, Zachary was given an opportunity to try his hand at painting and his dad supplied him with brushes, paint, and a canvas and let Zachary do his own thing. The results were so amazing that Zachary's dad quickly grabbed the video camera and filmed his son painting. Unlike his father's paintings, Zachary created an entire background, using wet paints and blending colors for a dramatic effect and then, inspired by his dad's technique, splattering the painting as the very last step, before he signaled the paintings completion with an "all done". Zachary's paintings always have a dramatic background and minimal splattering. His father's always feature a plain white canvas background and extensive splattering. His father's splattering technique has become a staple in Zachary's paintings which he still applies today. Although an occasion painting lacks the final splattering touch by his own choosing, most of his paintings have been consistent and the end results are museum quality abstract paintings. Zachary's paintings have been featured in galleries, art school's, and exhibits in Boston, New York, and other major cities.